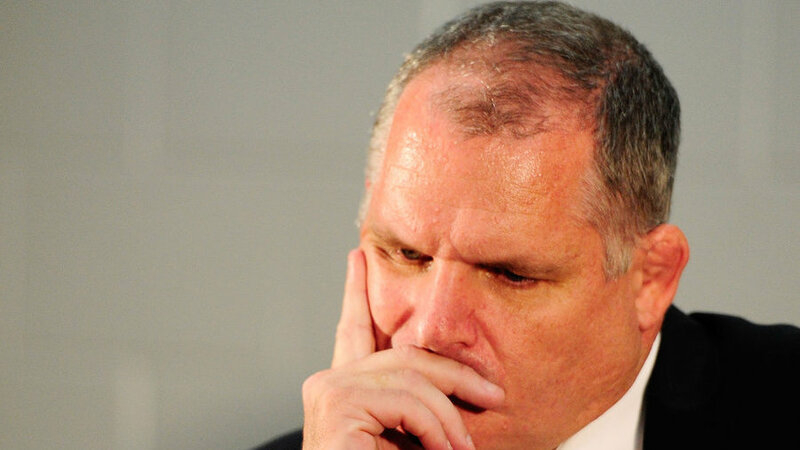 Ewen McKenzie has resigned from the Wallabies coaching position effective immediately. McKenzie made the announcement following the Wallabies loss and stated he had handed in his letter of resignation on Saturday morning but had only informed the team after the loss to the All Blacks. The news comes after a turbulent fortnight in Australian rugby where McKenzie had to field questions concerning Kurtley Beale's ejection from the team and Di Patston. "I've been a very proud contributor to Australian rugby but I feel at this point in time - there's a bunch of reasons I've put in writing to Bill - I had a discussion with him this morning, my intention was, win, lose or draw, that I was going to announce that resignation tonight," McKenzie told the press following their defeat to the All Blacks. "I've only just told the team. It's been a disappointing time for many reasons, I'm not going to go into the detail. "I've written to the board that I've been unhappy with a bunch of things, the easiest thing was to exit stage left and I'll leave you guys to ponder, speculate. I'll write a chapter in my book and you'll know all about it." ARU CEO Bill Pulver also addressed the media and spoke of the loss McKenzie will be for Australian rugby and the treatment he received from the media following the Kurtley Beale saga. Over the last two weeks, Australian rugby has been dragged through the mud. Rumours and conjecture aside, the basic facts are these: Australia will leave for their end-of-year tour on Friday without a coach, unless Bill Pulver is a master conjurer, and the Wallabies are back to square one with the World Cup 11 months away. No one takes any pleasure in seeing off-field scandal impacting on a national team but for Pulver to point the finger of blame at the public and press for their coverage of the recent scandals involving Ewen McKenzie, Kurtley Beale and Di Patston is crass and ill-judged. Pulver should be calling for unity, not increasing the divide. The irony is Australia were superb against New Zealand. It was a fine performance packed with character and no one showed this more than centurion Adam Ashley-Cooper. But that now counts for little. Australia now have five more matches before the end of their season and it will come down to player power to get them through it. Pulver wants a man to take over the Wallabies who can lead them to the World Cup and beyond. They do not want a short-term fix and so there is only one man for the job - Michael Cheika. "I think Australia has lost a great coach and a wonderful bloke and it's very disappointing we have lost a man like him," said Pulver, who attempted to talk him out of the decision. "In essence, Ewen said he was going to struggle to retain the level of support he needs from the playing group and, in my view, because of the character assassination he's suffered in the last two weeks. "The attack on Ewen was relentless and essentially left him with the view it set him too far back to be an effective rugby coach. I did not ask Ewen to resign, but understand his decision. He informed me this morning of his intention to resign, regardless of tonight's result. "Ewen is a world-class coach and a world-class individual who has been committed to playing entertaining rugby for our fans since he started in the role. During his tenure, he has overseen a seven-match winning streak, drew against the All Blacks and beat South Africa - all achievements that had not been met in the previous year. We sincerely wish Ewen well for the future professionally and personally." Pulver did not answer any questions on who would be taking over the position, but the Wallabies leave for their end-of-year tour on Friday. "Criteria for the role includes identifying a coach who can lead us to victory in next year's Rugby World Cup; represents rugby's core values; has the support of the playing group; and is available," Pulver said. "As part of this process, we will also identify structural improvements to the off-field element of the Wallabies, with a senior leadership role to be created to support the team. "We will work with the incoming coach on that structure, with a solution to be in place as soon as possible."